Doctor has moved to a small town in Montana, and has just rented half a duplex from Single Mom. He likes the view of the lake and his landlord. Single mom had rented to the last doctor, who apparently also appreciated the landlord, but not enough to stay once winter hit. She’s reluctant to get into another relationship, already having been abandoned by High School Sweetheart when she got pregnant, and then the last doctor. She’s also worried about her son getting attached to men who don’t stay. Initially, Single Mom has the town on her side. Everyone looks out for her, mistrusts Doctor, and almost spit every time they say “the last doctor.” He can’t have been that good, because it’s not long before everyone is singing the praises of Doctor, due to his medical competence. 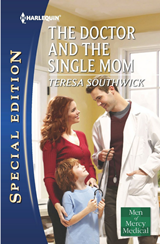 Single Mom enjoys his company, leading to a couple of steamy evenings that bring on mixed feelings in both of them. Doctor is an interesting character. He seems a typical hero for a romance novel: Smart, caring, attractive, wealthy, no bad habits, and good with kids. However, he has a weakness. He’s a big disappointment to his high achieving family, and his wife left him because she had hoped he would be more than a small town GP. He’s happy in his career choice, loves the small town, and isn’t swayed even when his grandmother, Lady Catherine de Bourgh, drops by and tells him to forget Single Mom and seek his fortune in the big city. Unfortunately his character weakness is not used to full advantage. As the end of the story approaches, our couple are in love, but realistically unsure of where the relationship is going. He has doubts about himself, and she has doubts about him. Then suddenly everything is settled, but the climax is a touch contrived and the resolution seems too easy. Like the title, the story is simple and straightforward. It’s an enjoyable light read, and there is some wonderful witty dialogue.